When I first became interested in woodworking 20 years ago, I relied on Norm to teach me how to build things. 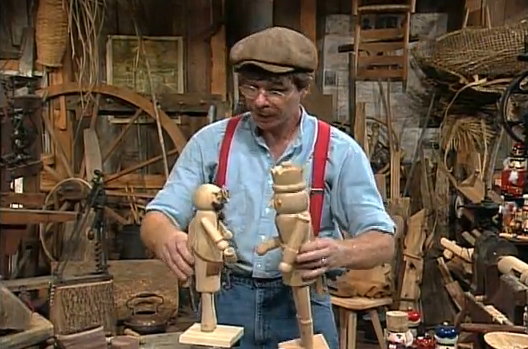 But besides the New Yankee Workshop, there was another show I watched regularly—The Woodwright's Shop. I was a power tool junkie back then, so I couldn't figure out why I was so intrigued with this guy Roy. He built things with antique hand tools and talked about old ways of working wood—things which were outside of my purview. But there was something Andy Taylor about him that I found very appealing. I liked his southern accent and conversational style, and his Mayberry charm made the day's stress disappear. On Roy's shows, he talks about self-reliance and human-powered energy—things that seem to be making a comeback. His episodes are still relevant, entertaining, and educational. Popular Woodworking Magazine is working to make all of Roy's shows available to us, including the early episodes of The Woodwright's Shop—episodes that most of us have probably never seen and to which we would never otherwise have access. Until now you could only watch his current episodes on TV, if your local station carries it, or the past few seasons on the PBS website. So far, PopWood has made the first three seasons available and is planning to add one new season each month. There are several ways to view Roy's shows based on your style. If you're like me and watch a program only once or twice, the six month streaming option (where you can watch any of Roy's videos as often as you like for six months for $69.99) might be best for you. If you're only interested in watching a couple shows from each season, then you can rent the individual episodes as you would any movie (i.e., you do not own them). And third, if you like to watch shows a number of times and want to develop a reference video library of traditional craft, then you might want to buy the DVD of each season. For answers to how the various options work, go here. To watch (for free) The Woodwright's Shop 20th Anniversary episode, go here. For 32 years, Roy has been animating traditional craft with wit and homespun appeal. He's become part of our history as a woodworking community, and I'm glad we'll be able to share that history with future generations.